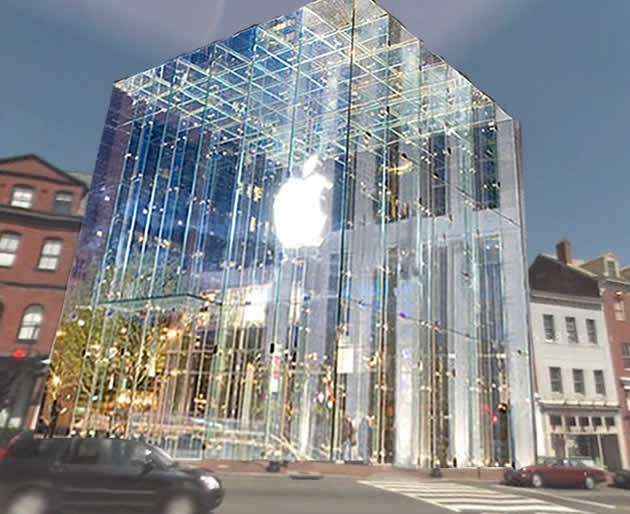 So Apple is facing opposition to putting up one of its gigantic glass-everywhere stores in one of Washington D.C.’s historic neighborhoods, the complaint being that it’d be too big and too modern to fit in with all the other quaint, cute buildings in the area (see our artist’s rendition above). I propose, however, that the complaint is a cover-up for a much more massive and sinister conspiracy involving Apple, Satan, and the White House. 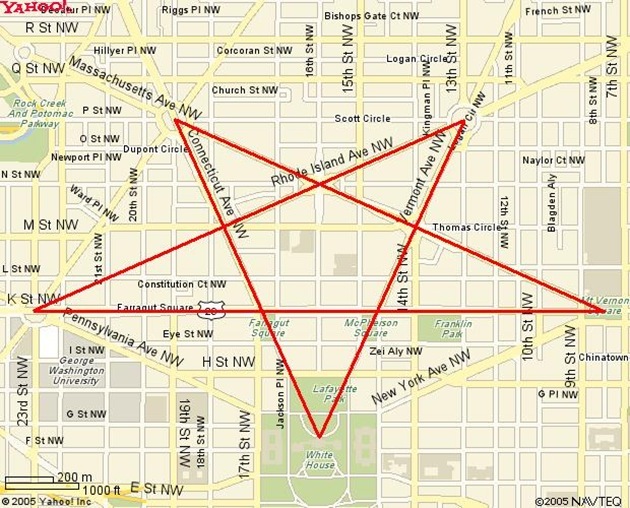 If you diligently follow Freemason conspiracy theories you’ll know that the Freemasons, who built Washington D.C., arranged the various main avenues that lead to the White House to form a pentagram, with the bottom point of said pentagram spiking right into the White House itself. 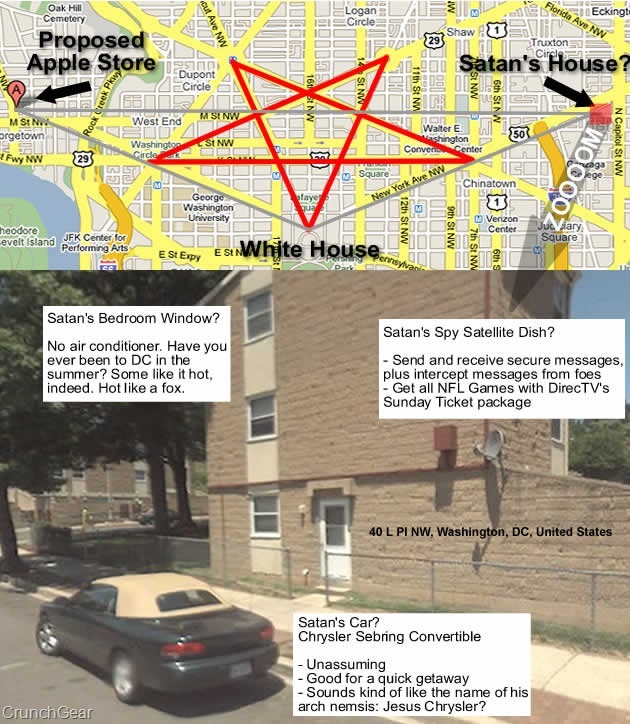 Now from the bottom point of the pentagram, the White House, we can draw a new line directly along Pennsylvania Avenue that will eventually run smack-dab into the location of the proposed Apple store at 1229 Wisconsin Avenue. We can then mark that point and draw an equidistant line from 1229 Wisconsin Avenue, all the way down M Street NW, directly through the middle of two of the pentagram’s intersections, finally ending up at a mysterious address: an apartment here at 40 L PI NW. An apartment, we can assume, that serves as a pied-a-terre for none other than Satan himself. Connect the line from Satan’s apartment to the beginning of the Apple line, and they reconnect spikey-style in the middle of the White House. I’ve taken the liberty of drawing up a map and I’ve taken a StreetView photo of Satan’s apartment, pointing out some interesting information. If you’re from the government or Apple, please don’t contact me as I don’t have any additional information for you. I’m just a mild-mannered gadget reporter with a keen eye for details. Thank you, that is all.